Research Interest: My research interests are concerned with the cellular and molecular mechanisms of diabetic complications (such as atherosclerosis and limb ischemia) and aging. I concentrate on the dissection of the interplay between key molecules linked to ischemic disorders, vascular stress and heart disease-related vascular injury, including Egr-1 (early growth response-1), PKC-beta (protein kinase C-beta) and RAGE (receptor for advanced glycation end products). 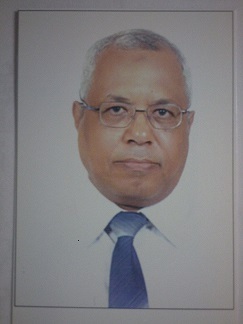 Biography: Dr. Hamdy Ahmad Sliem, currently serving as full professor of internal medicine and endocrinology in the school of medicine, Suez Canal University. Received MD degree from the college of medicine in 1994. Have over three decades experience in the management of diabetes, endocrinal disorders and evaluation of health status of those patients with chronic complications. In the last decade, have over 50 scientific publications in peer reviewed national and international journals, given multiple poster and oral presentations at various national and international conferences. Most of the publications were in the areas endocrinal disorders, metabolic syndrome, obesity, prediabetes, and impact of diabetes on cardiovascular and immune systems. Editorial board member in about 60 peer review open access international journals. Referee and per reviewer in more than 40 medical journals, more than 140 articles were reviewed in the last 6 years. Supervised and judged several medical theses and shared in many national projects related to different health problems. Significance of Serum Alpha-Glutathione S-Transferase Assessment in Hepatitis C Patients with Different Alanine Aminotransferase Patterns. Journal of Gastroenterology Research. 2011;4(1):13-19. The Histopathological Profile of Kidney Diseases In A Single Center In Egypt: An Overview Of 14 Years Of Experience. Journal of clinical and diagnostic research. 2011; 5(2)April: 295-299. Metabolic syndrome in the Middle East. Indian journal of endocrinology and metabolism. 2012; Jan-Feb 16(1):67-71. Human immunodeficiency virus and the endocrine system. Indian J Endocrinology and Metabolism. 2011 Oct;15(4):231-3. Chronic liver disease: Stem cell therapy. Journal of gastroenterology and hepatology research. 2013;2(3):434-438. Hepatic Embryonic Development and Anomalies of the Liver. Journal of Gastroenterology and hepatology research. 2013; 2(4): 489-493. Knowledge, attitude and practice of family physicians regarding diabetic neuropathy in family practice centers - Suez Canal University. International Journal of Medicine and Public Health | Oct-Dec 2013 | Vol 3 | Issue 4: 230-236. The effect of HUCB Stem Cells Transplantation on Preservation of Liver Vasculature in Mice. Journal of American Science 2013; 9(5):140-143. Study of Aspartate Aminotransferase to Platelet Ratio (APRI) Index as a Predictor of Early Virological Response to Interferon Therapy in Chronic HCV Patient in Ismailia Med. J. Cairo Univ., Vol. 81, No. 2, March: 189-196, 2013. Assessment of serum interleukin-18 level as a risk predictor of metabolic syndrome: Case control study. RRJMHS | Volume 2 | Issue 3 | July – September:64-68, 2013. Small dense LDL as a risk factor of nephropathy in type 2 diabetes mellitus, Indian journal of endocrinology and metabolism, Jan-Feb, 2014;18(1):94-98. Bio-informatics of metabolimics in type 2 diabetes mellitus. Journal of bioinformatics and diabetes, 2014;1(2):1-5. Reduction of Weight in Morbid Obesity: Medical and Surgical Advance. International Journal of Endocrinology and Metabolic disorders. 2015; 1 (1). Acetyl-L-carnitine and vitamin E protect against increased risk of cerebral atherosclerosis induced by high brain lipids: Biochemical and histochemical experimental study. Europian journal of biomedical and pharmaceutical science. 2015. Cardiovascular Risk in Obesity what is more? The Omentin? 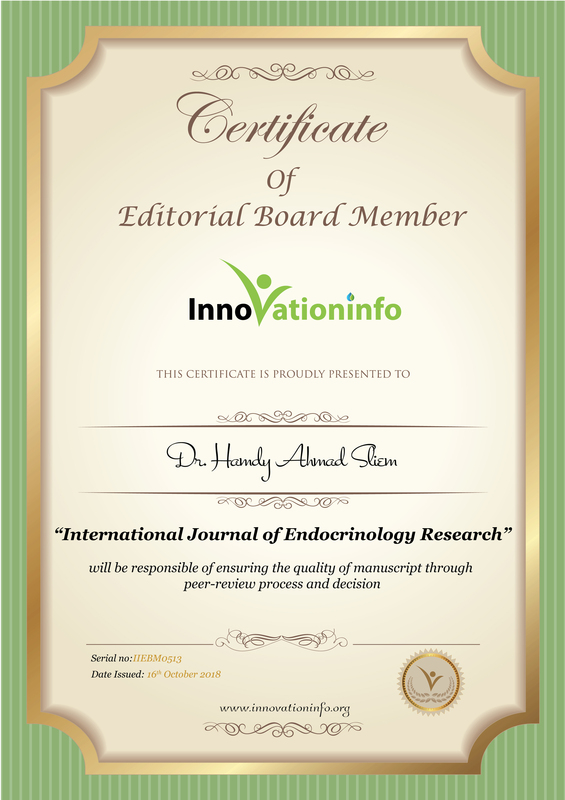 International Journal of Endocrinology and Metabolic Disorders 1(3), 2015. Monocyte chemoattractant protein-1 (mcp-1): a novel marker for arteriovenous fistula failure European Journal of Biomedical AND Pharmaceutical sciences. 2015; 2(2): 1-4. Psoriasis and Insulin Resistance: Is there a Relationship? International Journal of Endocrinology and Metabolic Disorders 2(2), 2016. Monocyte Chemoattractant Protien-1 (MCP-1) and Atherosclerosis in End Stage Renal Disease Patients British Journal of Medicine & Medical Research 12(9): 1-8, 2016. Adjuvant Control of Diabetes without Further Expenses: Sun Ray Exposure. Int J Endocrinol Metab Disord, 2018; 4(1). Is the thyroid gland another victim of diabetes mellitus. Journal of endocrinology and metabolism: open access. 2018; 2(1): e101. Hepatitis C Virus and Ischemic Heart Disease: A Controversy Relationship. SFJ Chro Dis. 2018; 1:1. Ketogenic Diet: To What Degree Can Be Valuable. SF J Obesity Research . 2018; 1:2.